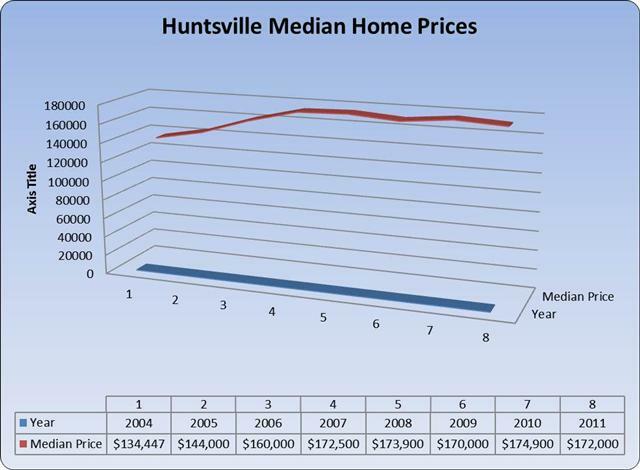 Our last market update post took a long term annual perspective and highlighted where the Huntsville Real Estate market was at the end of 2011. This weekend, I have been looking in some detail at how the 1st Quarter of 2012 has shaped up in comparison to the last few years, and while my conclusions are positive they are not as optimistic as much of the recent hub-bub around our market has been. Nonetheless there is much more good news than bad, and I must say that is one positive trend I can definitely live with. 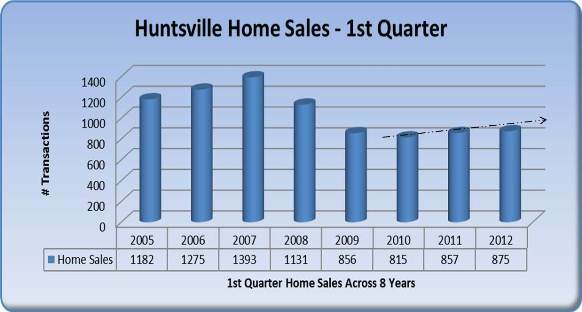 In the 1st Quarter of 2012, Home sales on a transaction basis rose by 2%, following a year-over-year increase of 5% recorded in the same quarter of 2011, thus for the first time in 5 years Huntsville Home Sales are on a steady upward incline. Nonetheless while this new positive trend is welcome news for home buyers and sellers alike, one doesn’t have to be overly observant to realize that if the present positive trend continues it will be another 3-5 years before the Huntsville Housing Market attains the pre-housing crisis levels of 2006 and 2007. 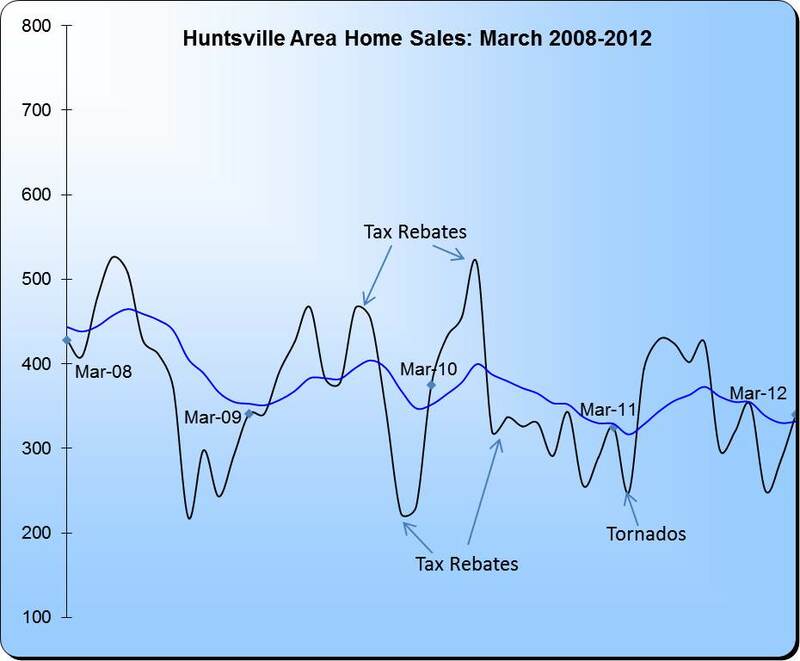 When one looks closely at the Huntsville Real Estate market month to month several aberrations stand out associated with abnormal events, such as the Tax Credits of 2009 and 2010 as well as last April’s tornado furry that struck our local market with a vengeance. Nevertheless by clicking on the chart to the left and examining the 12 month moving average, in some detail, one can tell that 2012 is really a year to pay close attention to, as it could be pivotal and the teller of events to come. 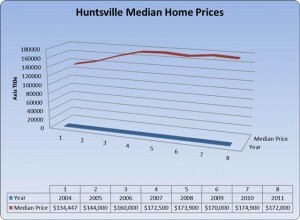 Huntsville Median Home Prices – Up or Down? If one watches closely the month to month market reports generated by the Huntsville Area Association of Realtors as well as others, it is a bit confusing because as often as Home Prices are reported to be up, they are also reported to be down. 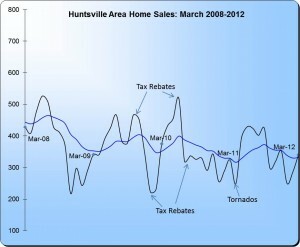 Thus is the case when the actuality is that Huntsville Home Prices are Flat and neither up or down since Home Prices also adjust seasonally along with Home Sales. So don’t read too much into these month to month reports. Flat home prices are just that: flat. By clicking on the chart above you will see exactly what I am saying. Yet given other markets across the US flat home prices would certainly be welcomed news.